Magnetic microbot capturing, dragging and releasing a live cell. Credit: Koohee Han and Dr. Wyatt Shields, provided by Prof. Orlin D. Velev, NC State University. 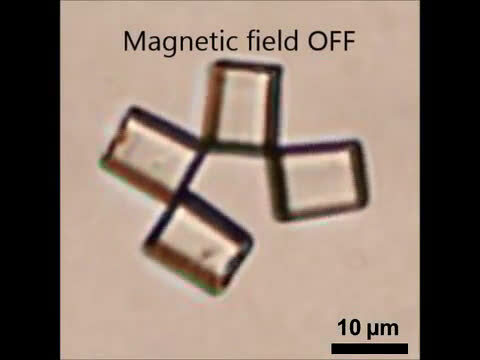 Researchers at North Carolina State University and Duke University have developed a way to assemble and pre-program tiny structures made from microscopic cubes - "microbot origami" - to change their shape when actuated by a magnetic field and then, using the magnetic energy from their environment, perform a variety of tasks - including capturing and transporting single cells. The findings, published today in Science Advances, pave the way for microbots and micro-origami assemblies that can serve as cell characterization tools, fluid micromixers, and components of artificial muscles and soft biomimetic devices. "This research is about a topic of current interest - active particles which take energy from their environment and convert it into directional movement," said Orlin Velev, INVISTA Professor of Chemical and Biomolecular Engineering at NC State and co-corresponding author of the paper. 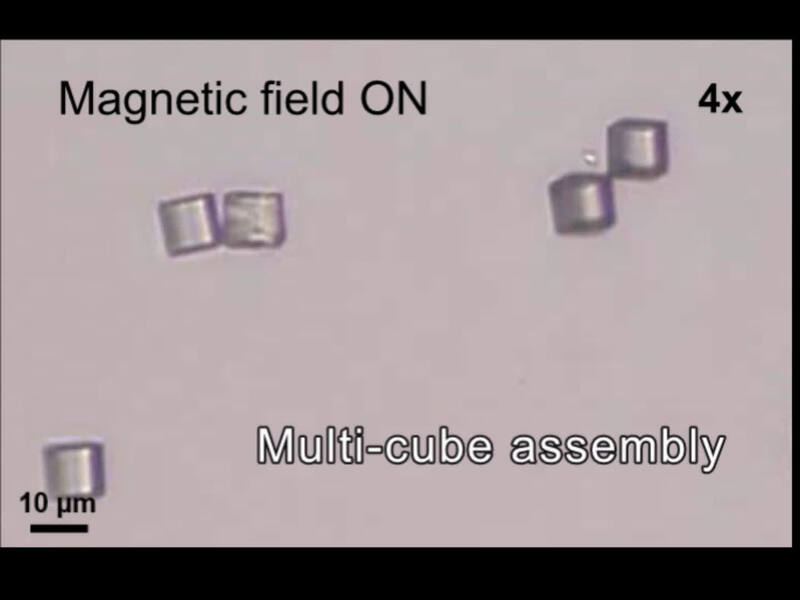 To create the microbot origami, the researchers started with microscopic polymer cubes that are metallic on one side, essentially allowing the metallic side to act as a magnet. Depending on their positioning, the cubes can be assembled in many different ways. "Since they are magnetized and interacting, the cubes store energy," Velev said. "Tiny particles in the shape of cubes can attach together in sequences where they face in different directions to make, for example, clusters that behave like a tiny Pac-Man: You can open them by applying a magnetic field and then let them close by turning the magnetic field off. They close because they are releasing the stored magnetic energy. Thus, you inject internal energy every time you open the microclusters and release it when they close." The researchers then gave the tiny Pac-Man a specific task: capturing a live cell, in this case a yeast cell. 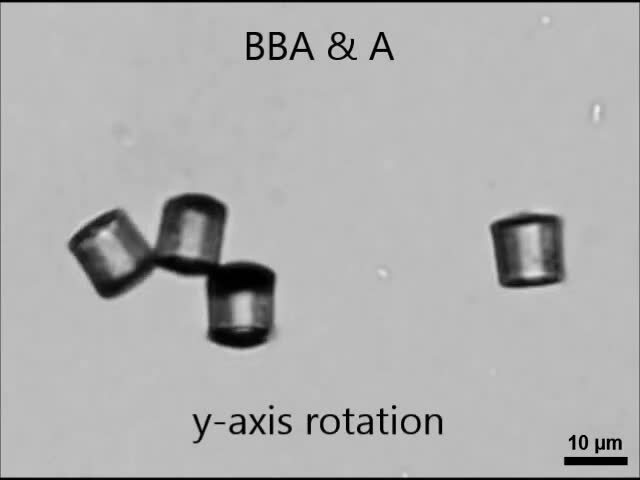 The microbot formed into a boxy shape and, through its opening and closing motions, "swam" to surround the yeast cell. 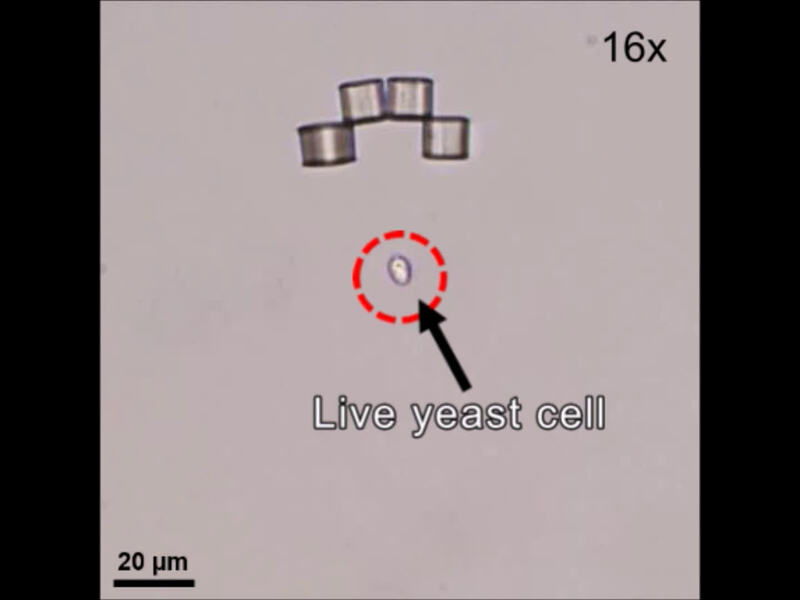 The researchers then turned off the magnetic field that controlled the folding of the microbot to capture the yeast cell, moved it and finally released it. "We've shown here a prototype of self-folding microbot," Velev said, "that can be used as a microtool to probe the response of specific types of cells, like cancer cells, for instance." "Previously reported microrobotic structures have been limited to performing simple tasks such as pushing and penetrating objects due to their rigid bodies. The ability to remotely control the dynamic reconfiguration of our microbot creates a new 'toolbox' for manipulating microscale objects and interacting with its microenvironment," said Koohee Han, a Ph.D. candidate at NC State and first author of the paper. "As the microbot folds, it can compress liquids or solids and you can use it as a tool to measure bulk mechanical properties, like stiffness," said Wyatt Shields, a postdoctoral researcher at Duke University and NC State University who co-authored the paper. "In some ways, it is a new metrological tool for gauging elasticity at the microscopic level." The authors say that the design of microbot origami mimics nature. "The cube sequence programs the shapes of the folding microbots. Proteins work in the same way," Shields said. "The sequence of amino acids in a protein will determine how it folds, just as the sequence of cubes in our microbot will determine how it folds." Velev says that future work will concentrate on making the particles move on their own, rather than steering them with magnetic fields. Han is working on making bots that self-propel in complex fluids with non-Newtonian behavior. Shields is studying how the dynamics of the microbot reshaping could be used to study the microstructure of surrounding macromolecules.